Sonic Mania users to get new content via free update. Sega has announced Sonic Mania Plus, a physical release version of Sonic Mania with new features. It will launch this summer. 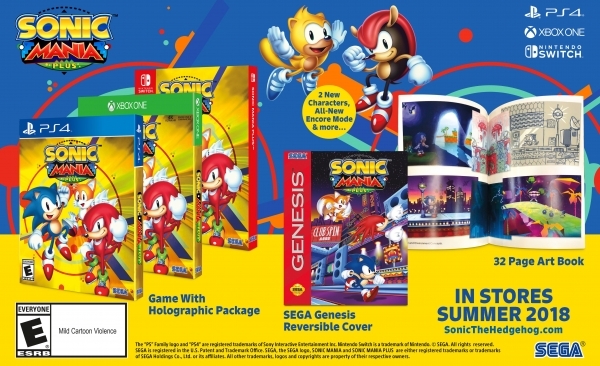 The packaging will feature a holographic slip cover, reversible Sega Genesis / Mega Drive-branded sleeve, and 32-page Sonic Mania art book. It will cost $29.99. Users who already own Sonic Mania will be able to get the new content of Sonic Mania Plus via the “Encore” downloadable content pack, the pricing of which will be revealed at a later date. Pre-orders will open on March 19. A true, classic Sonic experience: Gorgeous pixel graphics featuring a variety of new Zones with iconic favorites from Sonic 1, 2, 3, Sonic & Knuckles, and Sonic The Hedgehog CD. All-new Encore mode: A new mode that adds a fresh look to familiar locations while challenging new and veteran players alike.